Do you like Jungle Roller? Share it with your friends. 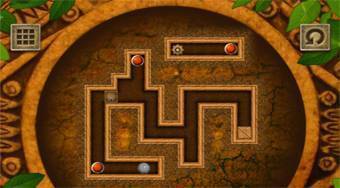 Jungle Roller is a wonderful perception game in which you have prepared a total of twenty different levels of difficulty. In each round, your task will be to rotate the jungle playing surface in such a way that the gray ball reaches its target. Rotate the board, turn on various switches, avoid obstacles, and get the ball into an open hole.